Equine America Magnitude contains essential magnesium needed in the body for healthy nerve function. In magnesium deficient horses, behaviors exhibited are likely to be that of nervousness and tension, which can often have a number of detrimental effects on the overall well-being of your horse. 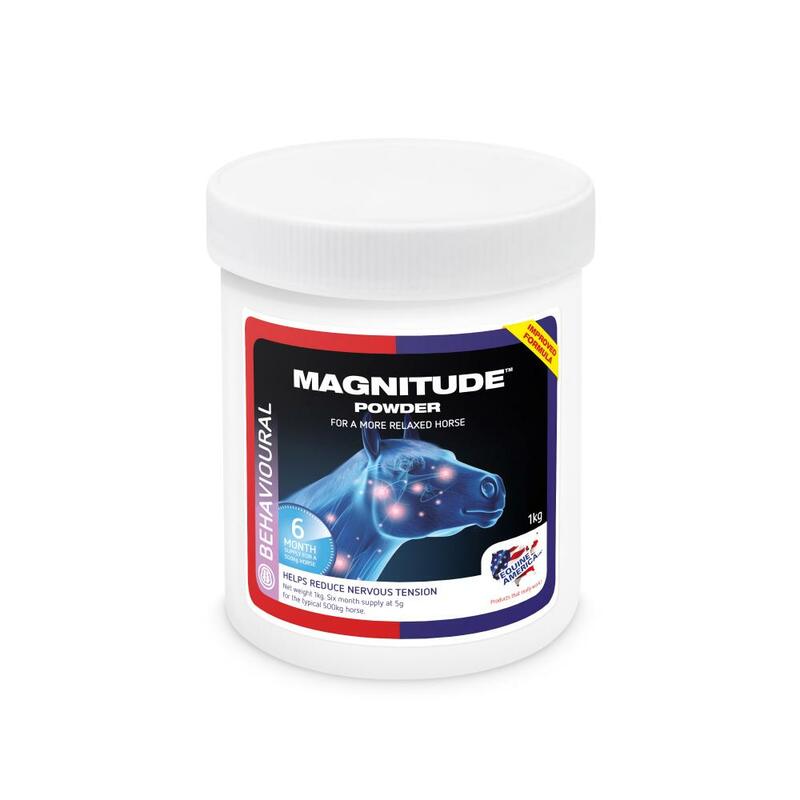 By supplementing highly absorbable Magnitude into its daily feed, you are ensuring your horse has enough magnesium for promoting healthy nerve tissue and thus reducing nervous tension and anxiety. Magnitude - slight colour change – but the same great product, now with even more quality assurance! We are pleased to confirm that that there is no difference in the magnesium levels, or the chemical source of the magnesium used (magnesium oxide - MgO), only in the physical form of MgO we are now using. This change in physical form (to the slightly more granular form, with a pale beige colour) has arisen because we are delighted to report that we are now manufacturing the Equine America (UK) products in the UK, using certified facilities with the highest standards of safety and production. Although Equine America (UK) products have always been free from prohibited substances, our new UFAS and BETA NOPS certifications will provide further reassurance in the light of the recent high profile prohibited substances cases, giving our customers peace of mind regarding FEI, BEF and BHA prohibited substances, enabling full traceability. In order to comply with the rules and regulations regarding these certifications, we are only able to use certain suppliers, who are also certified, and have had to make a change to our supply of magnesium oxide, so we are now using the lower dust, slightly granular form, which is pale beige. Compounds of Trace elements - Calcium Carbonate - E170-25,000mg/kg. For an average 500 kg horse, feed 5 grams daily with the horse's regular feed. Repeat as required or as advised by a veterinary surgeon. Feed others according to body weight, less for ponies and smaller horses and more for larger breeds. Below are some recent questions we've received regarding Equine America Magnitude Horse Calmer, including answers from our team. Why has this product changed I have been using it for years as a white powder but the last tub I brought is brown and looks more like minerals? As we do not manufacture this particular product we are not sure if the ingredients have been amended recently. What we have to keep in mind with these natural products is because of their active ingredients, the colour, smell and most commonly taste/texture can change as they are all naturally sourced. We can ship products which are already available and approved in the USA. We cannot send products which have not been approved by your authorities as being safe. This product has of course been approved and so we can ship to the USA. We charge for delivery (normally £10) and of course you must allow for the conversion of US dollars to GP pounds when comparing prices.